Melissa VanSant recently interviewed one of GLN’s new teachers, Abdelrahman Youssef. Read more to learn about just one of our teachers who create the unique learning environment that is found only at The Global Language Network. Register for a class to discover this for yourself. GLN would like to personally thank each teacher who makes GLN the truly special place that it is for learning, sharing and supporting intercultural linguistic development. Abdelrahman Youssef, an Egyptian chess master and Arabic instructor at American University in Washington, DC, teaches Arabic classes at The Global Language Network on Sunday nights at our Farragut location. This semester he is teaching Arabic Foreigner, through which he is joining our dedicated and truly inspiring team of Arabic, Middle Eastern and African language teachers as part of our broader roster of amazing volunteer teachers from around the world who share their languages and cultures through GLN. 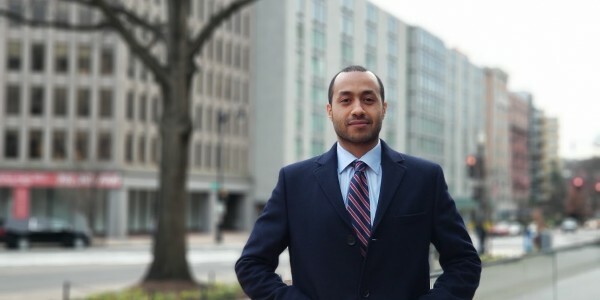 Originally from Egypt, Youssef moved to Washington, DC, to pursue a career in journalism and deepen his understanding of the English language and American culture. Since moving to DC, Youssef has coached swimming, continued to play Egyptian chess on a competitive level, and tutors students in Arabic. As an advocate of cultural engagement and learning, Youssef wants to continue his work as an instructor and to bring his talents to GLN. For people interested in enrolling in his course, there are several things Youssef wants to highlight regarding Arabic and the experience of a student in his classroom. Youssef explains that there is not necessarily a globally monolithic understanding of the Arabic language. Instead, it houses various dialects, ranging in pronunciation, emphasis, and colloquial vocabulary, according to the region. For many people, their knowledge of Arabic concentrates on Modern Standard Arabic (MSA). As an entry-level class, Youssef’s Arabic Foreigner will incorporate components of regionally diverse dialects into MSA and equip students with the tools for understanding both the language and the culture. According to Youssef, “communication is the strongest and most important habit. I believe that language is culture, not just sights and sounds”. This is an outlook that fits in well at The Global Language Network. For this reason, Youssef asks his students of their objective in the class. Depending on which area, person, or environment a person envisions employing the language, Youssef constructs a lesson plan customized for these objectives. He teaches his students the basic rules of Arabic that allow them to expand this foundation into a broader understanding of the world. Arabic has three tenses, and the hardest part of learning it for most Americans lies in their conception of the grammar rules. Youssef will dissolve these notions and fully engage the student with the material, reflecting his own idea that communication breeds human connection and has the capacity to shift cultural understandings. In addition to folding a variety of topics into the classroom, Youssef explores the unique cultural quirks of the Arab world. For instance, a customary exchange between strangers likely ends in an invitation for a drink. When proposed once, this invitation is simply polite and the stranger does not expect its acceptance. However, if the invitation is extended at least four times, their intention is sincere and it would be appropriate to accept the offer. Youssef’s favorite topic is his American Politics and Government course at a local college, and he utilizes the variety of vocabulary it presents to further his own understanding of the English language and American culture. He mimics this in his own classrooms at GLN, weaving cultural understanding into each tailored lesson plan and ensuring his students feel confident in their foundation of Arabic. Abdelrahman’s Arabic Foreigner class is enrolling now along with 20 other classes. Please join us for this spring semester. Email learn@thegln.org for more information. Are you a native speaker who is ready to share your language and culture? Join us by emailing teach@thegln.org to be invited to one of our upcoming teacher training seminars.